Sky Box Office serves up a diet of films not yet available on the general Sky Movies channels, up to 20 movies every day, starting at different times. Forget about viewing Sky Box Office movies live! Reason one is the limitations of live pause. Even though you can live pause a box office movie, you can't half watch it, dump the paused version to the planner and catch up later. If it's on live pause you have to watch it to the end, as you can't view other recordings in the Personal Planner, or even watch live TV. If you don't watch the movie, you don't pay! If you watch the movie, it can be replayed throughout the next 24 hours as many times as you like at no extra charge. Where as normal live multiplay allows a viewing window only from 6am to 6am in any 24 hour period If you find that you want to view a film that you'd started to watch, but for example only have 10 minutes of the 24 hour viewing window left, if you press play within that time window you will be allowed to complete the playback even if the end of the film is outside the 24 hour window, a warning message will be displayed at 24 hrs saying that "when you come out of the Play function, this recording will be deleted"
Best of ALL is the ability to record ALL Sky Box Office Movies onto your Sky+ so that you have a true movie on demand service. No waiting an hour for the next showing of a film for you, if you previously recorded it, just play it whenever you wish. It's instant, it's fast, and incredibly recording ALL the movies is absolutely FREE ! Just go into the EPG then select Movies, and on every 2 hour timeband for example, record a different movie. You can set up the recording of say 10 movies, in less than 2 minutes. 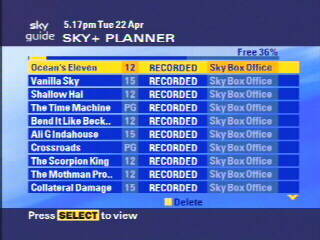 The recording of these movies is a good task for your Sky+ to be doing overnight, so you have less programme clashes. When you wake up you will have a selection of films that you might be interested in at some point in the next 7 days, but with absolutely no commitment to viewing or paying for any films you don't want to watch. After recording all these box office films, if you're running short of disk space for your normal programmes, just delete all or some of the movies, record & watch your normal programmes, and when disk space permits set back up the recording of ALL the movies you might be interested in again. You can do this as often as you like every day of the year and it doesn't cost a penny. It is only when you decide to press play on the selected Box Office Movie that he charge is made to your Sky account. So next time, instead of saying "there's nothing on" why not go to your previously recorded library of Sky Box Office Movies and choose a film that suits your mood. It's instant, it's flexible and it's free to have all these movies on tap 24 hours a day. Just one request to Sky, can we very busy Sky+ viewers have seven days to view a film once we've started viewing?